Advanced Design and Built for a specific environment in mind our FHW Series Marine Grade Deck Lights sail the seas all over the world and perform day in day out under the harshest of what the ocean environs deliver. Using Quality high grade materials to construct the FHW series Nautical Lamps has made this design a world leader in the Shipping, Aquaculture and Commercial Fishery Industries. Our Marine Grade FHW Series LED Flood Lights are ideal for Ships, Boats, Decks and Aquaculture. World trusted & used in the marine shipping industry on ocean cruise liners and container cargo vessels for Ship Deck Lights and internal engine room lighting. The strong design & construction of the FHW Ship Deck Lighting is made with an aviation grade cast aluminium high performance heat sink to dissipate the heat quickly which extends the LED Chips life. The FHW Series adjustable mounting bracket is strong and will handle the pounding of crashing seas & the constant propeller vibrations or cavitation. The FHW series will give years of maintenance trouble free service and is backed up with a manufacturers 5 year warranty. 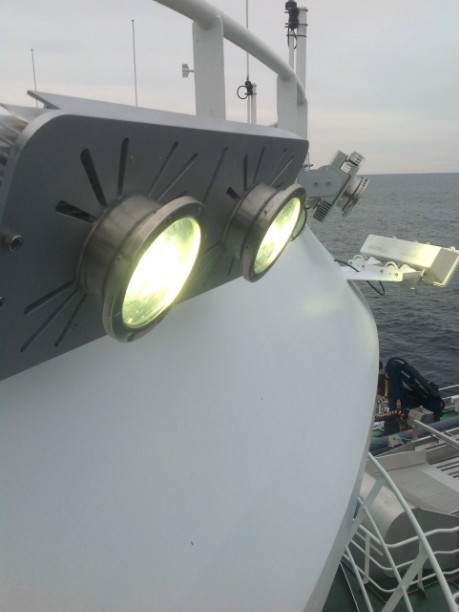 We use high bin grade Osram LED chips when we manufacture your Ship and Boat Deck Lights. ​Osram was founded in 1906 and companies such as GEC used the Osram filament in their own bulbs. Today Osram continues to be a world leader in the development of opto-semiconductors we know as LED technology (light emitting diodes) and along with its marketing brand Sylvania Lighting its a trusted and well recognized brand. ​Learn more about Osram by clicking here. Powered by Osram LED Semiconductor technology. Available in 24-48 Vdc or 85-305Vac input supply. Used extensively in the aquaculture industry for farming fish & algae farming the FHW Series Marine Grade Flood lights are specifically designed for twenty four operation and harsh environments where salt air and high humidity are present. FHW Series Marine Grade Flood lights are tested and proven. We think they are the best designed aquaculture farming light available. Download the pdf file below for more information and prices on our Marine Grade LED Deck Lights FHW Series, Nautical Lamps, LED Flood Lights for Ships, Boat Deck LED Lighting and Aquaculture Farming . Algae Farming is a very interesting field of science and with over 40,000 microalgae species there is something for every one in learning how it can transform our food chain and dietary habits to future organic fuel sources. Click here to learn more about the amazing world of Algae and Algae Farming from the CSIRO Website. and our Aquaculture Growing Lights pages here below. Buy Online here below and have our Marine Grade LED Deck Lights, Aquaculture, Nautical Lights shipped to your door or dock. Choose your beam angle and colour temperature and please allow 4 to 6 weeks to manufacture, quality test and deliver your purpose built deck lights.